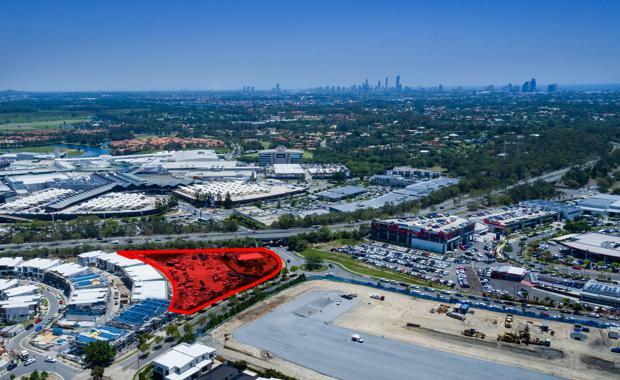 A rare opportunity for developers, investors and owner-occupiers is set to enter the market in the centre of CBD Robina's thriving residential and commercial precinct. The opportunity will come in the form of a high profile 7732 square metre mixed-use parcel at 578 (Lot 515) Christine Avenue, which is approved for development of up to eight storeys, on the market. The corner site, provided by the Robina Group and fronts The Crestway and Robina Parkway, is less than 150 metres from Robina Town Centre. It is located at the gateway to Robina Town Centre, the $200 million Robina Automall, the $250 million CityVillage residential community and QIC's Robina Home and Leisure Centre, which is under construction. The site is being marketed by Colliers International's special projects national director, Darrell Irwin, and associate director Geoff Lamb through an offers to purchase campaign, closing 2 March 2017. Robina Group director Tony Tippett said the release of the land was a strategic decision that allowed the developer to focus on its extensive pipeline of residential and commercial projects, including the recently released $170 million Vue Terrace Homes. "Demand for property in Robina is at a historic high, with both residential and commercial property experiencing some of the lowest vacancy rates in Gold Coast City and, indeed, Australia-wide," he said. "As one of the city's key economic hubs, it's important for the development momentum to continue in CBDRobina in order to service this demand, and activating prime new sites will help to achieve that. "Mr Irwin said the site was approved for a wide variety of uses, including automotive, showroom, office and residential development of up to 300 bedrooms. "The flexibility to develop a wide range of commercial and residential projects - or a mix of both - and the high level of exposure, with more than 12,600 vehicles passing each day, makes it an extremely rare offering. "The site falls under the Robina Central Planning Agreement (RCPA) meaning substantial town planning advantages. "Mr Lamb said the significant growth tipped for Robina would continue to underpin new development in the area into the future, with the 30,000-strong population to double within a generation. "It is a similar story for employment numbers and when you consider 260,000 people visit Robina Town Centre each fortnight alone, the number of people accessing services in the suburb each day is considerable," he said.